Datix2App is a multi-purpose app for Android smartphones. It is the winning technological solution for innovating guard service management, mobile workforce management and lone worker protection. Combining NFC scanning and GPS tracking with the cutting edge functions typical of a man down alert system (panic alerts, loss of verticality and extended immobility), Datix2App stands out as a smart and integrated solution for tracking and protecting your valuable people and assets and remaining sure about their safety. The app is compatible with existing software platforms including Datix RTS, Datix Suite, Datix Suite Web and even Datix2Cloud. Call us for live demonstration. Datix2App is an innovative and modern system compared to traditional patrol systems based on proprietary handsets and scanners. Datix2App helps security organizations and guard firms to manage and monitor their patrol systems in an increasingly effective and convenient manner. You need only locate the NFC tags along the patrol path and use the smartphone in which the Datix2App is installed. Patrol data are then sent in real time, or depending on the configuration selected, to the monitoring station and are immediately available for checking and comparing with plan. Datix2App converts the smartphone into an innovative handset for monitoring the location of off-site mobile workers. Employees use their own smartphones or those provided by their company to report the beginning and end of their shift by scanning the NFC tag identifying the site where they are working. The company can therefore check arrivals and departures in real time and calculate time and costs. A comparison between the recorded NFC time attendance details and GPS coordinates ensures further certification and transparency for the work performed. Datix2App is a valid aid for increasing the safety of lone workers or those engaged in risky activities. 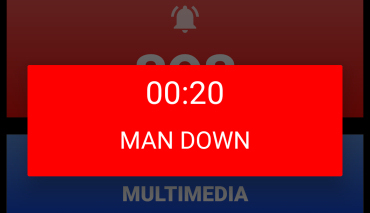 The app converts a smartphone into a genuine man down system for lone workers. The app is capable of creating an alarm signal if the panic button (SOS) is pushed or automatically identifying loss of verticality or extended immobility. The alarms can be sent as text messages (SMSs), by data connection to the monitoring station or by automatic telephone number dialing.